Carpet Cleaner in San Diego Reveals Spotting Secret! Why do my Spots Return? Our family has been cleaning carpets in the San Diego area now for approximately 20 years now. Ever since we started cleaning, one of the major concerns our clients had was their spots and traffic areas coming looking dirty really quickly. I can’t count how many times I have heard the homeowner blame the carpet for being the problem. How do I keep my Spots from Returning Quickly? 1. Stop using Carpet spotters from the market that contain Soaps and Detergents! All your market brand cleaners (Spot Shot, Resolve, Woolite, 409 Carpet Spotter and even Folex) have a sticky residue to them. The all contain a cleaning agent that will leave your fibers sticky and ready to attract soil immediately. If you doubt this or if the spotter says No Soap, put it to the test. Pour some in a small glass and stir it quickly with a spoon. If you see bubbles, you have soap! Also, spread some in your hands and rub them together, now let it dry for a minute or two. How do your hands feel? Sticky? Yep, there is Soap in there. Well this same residue is being left on your carpets when you spray them in to the fibers, agitate them, and then just blot with a towel. Would you do that to your hair? Imagine taking that same spotter, spray it in your hair and then using a towel to dry it up. Yuck!! That’s what home owners are doing everyday to their carpets. That is why Spots reappear quickly! 2. Find a Professional Carpet Cleaner that is 100% Soap and Detergent Free! 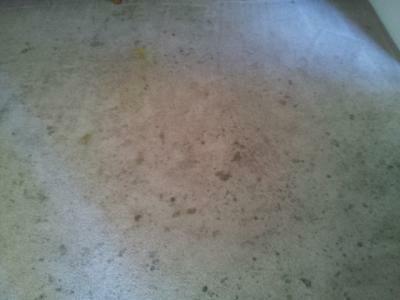 Carpet cleaners are doing on a large scale what I just described about spot cleaning. Possibly you have seen the cleaning process. Most “professional cleaners” precondition the carpet. With Soap! Then they use a wand to inject hot water with another soapy cleaning agent into the carpet to remove the dirt. More Soap added to the carpet. They don’t rinse the carpet at all, this takes more time. So what you have now is a clean looking carpet. Spots are gone, but, the residue left behind the whole carpet is making your fibers a magnet for dirt, within a few weeks, of walking on and vacuuming your carpets. Walla, your carpet looks the same if not worse than before the cleaner was there. You are Not Alone! What you need to do is search for a 100 % Soap Free Professional Carpet Cleaner. If he is truly soap and detergent less in his cleaning, he will be able to educate you just like I did. He should also be completing the cleaning with an Acidic Rinse to bring the carpet closer to a neutral ph state. This also helps carpets stay cleaner longer. I hope you found this interesting and educational. If you are wondering if we at Peninsula Carpet Care are 100% Soap Free. Absolutely! We practice what we preach. Please learn more misconceptions and solutions to your carpet issues at www.PeninsulaCarpetCare.com There is a great Consumer Awareness message that is super helpful.